Somewhere along the drive home it occurred to Wayne that science had rendered sixty the new middle age — or would, by the time he reached a-hundred-and-ten. He knew, too, that this improvised errand his wife had sent him on was the setup to a benign trap, that a surprise sixtieth birthday party waited for his return. Of this he was confident. Wayne was known for his confidence, and for his far more appealing wife. A year into early retirement, he had taken up watercolors and already claimed himself a superrealist. Several lessons into his piano playing he began to liken himself to a young Bud Powell. This lack of self-reality provoked in friends an odd endearment, a kind of compassionate pity. And so at the garden party at home the crowd screamed Happy Birthday! And Wayne shrieked a bit too enthusiastically: I can’t believe this! The party had been going well for an hour or so, when a doe entered the middle of the yard from behind a magnolia tree. As if just another guest. Wayne assumed this was a prank by his brother-in-law. That someone might jump out of the deer. But her flank was badly scarred, perhaps from a car. Her impossibly authentic looking eyes had locked on Wayne’s. He felt something tug and flush in his chest, a small seizure, the air around him rupturing. And then Wayne lifted. Lifted over the crowd, where now he saw his father standing over the kitchen counter of their cabin in Michigan where there lay the body of another doe, hit by the car that day so many years ago. Butchered and put into the freezer, she would last two seasons. Participating in her death made her taste sacramental, even if Wayne did not understand the complexity of her taste each time. And Wayne, seven or eight, was now in the rowboat on their small lake, skimming shallows for turtles; holding the medium snapper he had snatched from beneath a clutch of pond grass close to his face, little Wayne asking his newfound friend’s retreated red and yellow head to show itself, pleeeeeese; the head darting out to bite Wayne clean through his cheek, blood running down his face, a lifelong v-shaped scar (later attributed to a college fencing incident). Ice fishing with an uncle who would die in a car accident someday. A badger that looked like stole strewn with teeth, rasping back at that barking dog. Wayne falling down the stairs, failing a hearing test, hitting ice during winter football. And then Wayne looked much as he looked today. He saw the canvas on his easel, unfamiliar, brushstrokes smeared, limited to pinks, blacks, grays. As if he had used his fingers. His wife in the doorway watched Wayne enter the room like a damaged child. His wife seemed frail. Now Wayne was banging the piano with his fists. His wife weeping into the phone, he could see her soul hovering grayish, parting from her body slightly, rubbing against the warmer air of her flesh. She was leaving him. And suspended in the air, all Wayne could hear himself thinking was My fingers, eating keys. She had taken his paint away. Wayne was walking crabwise, backwards, sometimes forward, confused. His wife on the phone again, her soul lifting of her warmth altogether, her shadow shaking Wayne free of her. Wayne was surrounded by extraordinarily old people. Light from a window bleached the room. The thermostat set high, compensating for the gathered lassitude. Muttering to himself. No one asked his opinion. Wayne descended from this vantage, possibly created by a prank-deer. Planted possibly by his wife’s brother -- who always sang harmony when it came time to sing the Happy Birthday song, and insisted on trick candles for the cake. Now the lawn again supported Wayne’s sixty-year-old feet at the party thrown on their behalf. 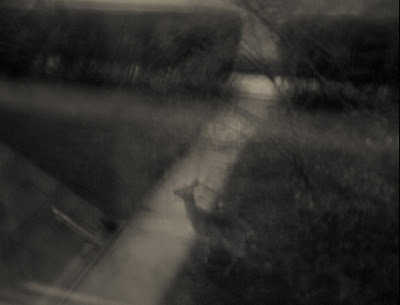 The deer was gone, his wife was leading him through thickly-peopled applause. The soft grass, the terra firma. Clustered friends parting for Wayne and his wife, allowing passage to the cake ahead. The sixty lit candles. Were these people just another trick? Were the candles supplied by his brother in law? To which Wayne expelled, scanning the cake with his breath, his wind leveling miniaturized devastation, the sparking smoke, the collapse of this dioramic empire of sixty lights. The crowd’s Whoas and clapping splattered as Wayne, center of attention, blew out every candle. Then inhaled and blew again. The crowd half-chuckling because there really was not anything left, Wayne. His breath now battering these smoldering wicks, and he felt very dizzy, breath begging Please of the withering sticks. Please, to the timepiece in front of him. He recalled the venison had tasted, each time, like it had been hit by a car. You could taste the adrenaline of its last moment on earth. Sixty lights down, how many remaining? He inhaled, blew again, nail-guns spitting off a roof not far away. David Ryan’s fiction has appeared in BOMB, The Mississippi Review, 5_Trope, Denver Quarterly, Cimarron Review, Tin House, Alaska Quarterly Review, Hobart, New Orleans Review, and the Norton anthology, Flash Fiction Forward, among others. The collapse of this dioramic empire of sixty lights.